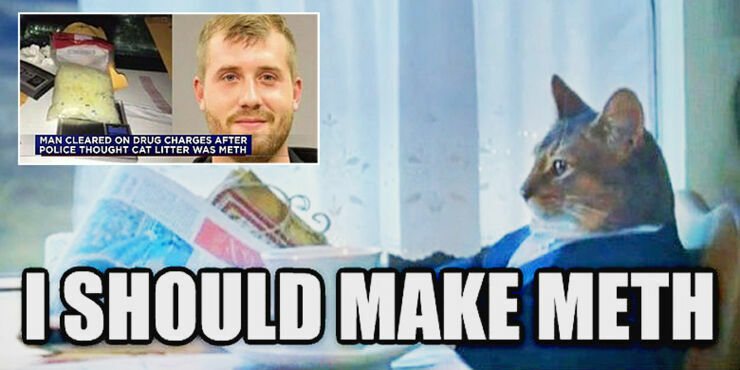 Be careful if you're driving around with cat litter in your car, because you might just lose all of your 9 lives, get arrested and thrown in jail. That's what happened to a Texas man called Ross Lebeau who was charged by the Harris County Sheriff's Office (HSCO) with possession of nearly half a pound of methamphetamine. A traffic stop in December 2016 caused the deputies to believe they had busted a meth dealer when they found what they believed was a suspicious substance stuffed in a sock. LeBeau kept the cat litter in the sock on his car dashboard to help stop the windows fogging up. "They thought they had the biggest bust in Harris County," LeBeau said. "This was the bust of the year for them." So they arrested Lebeau and sent out a press release with a mug shot and a description of the bust. Which meant local news stations picked up on it, and LeBeau's family and friends saw his picture associated with a drug bust. The whole thing is strangely reminiscent of an episode of the TV show Breaking Bad. After the arrest Lebeau was taken to get his finger prints donen and booked into jail, where he spent three days after two field tests undertaken by deputies came back positive for meth. It wasn't until a third test was done by the county's forensic lab that it was finally revealed not be a controlled substance but kitty litter, and the case was dismissed. The misreadings in the field test have been put down to faulty equipment but Lebeau says he still lost work because of it. Although he doesn't blame the deputies. "I was wrongly accused and I'm going to do everything in my power, with my family's backing, to clear my name," he said. "Thank you everyone who supported me through this crazy rollercoaster." Lebeau said. "I am very appreciative of my friends and family that helped me along the way. Together we can spread awareness, and make sure no one else has to suffer through false incrimination due to faulty test." He concluded, "A lot of people plead guilty to these crimes because they can't afford to be bailed out."